Middletown, Connecticut (CNN) -- Five people were killed and at least 12 were injured in a gas explosion Sunday at an under-construction power plant in central Connecticut, local officials said. Residents up to 20 miles away reported hearing the blast at about 11:19 a.m. at the Kleen Power Plant in Middletown, a suburb of Hartford, Connecticut. "There is no present or continuing threat to anybody from either substances getting into the atmosphere or of a possible subsequent explosion," Middletown Mayor Sebastian Giuliano said, adding terrorism has been ruled out. He said plant workers were purging a natural gas pipeline when the explosion occurred. "Urban search-and-rescue teams are on the premises ... with dogs, attempting to locate and account for further victims," Giuliano said. It's unknown how many people were working in the plant, which was about 95 percent complete, at the time of the explosion. Multiple contractors were involved in the project, Giuliano said, complicating efforts to account for those who may have been on the site. "[Each contractor] has their own foreperson, their own employee list, so we're trying to sort that out," Giuliano said. Deputy Fire Marshal Al Santostefano said later Sunday that no one has come forward with any names of missing people and dogs have not detected signs of life beneath the rubble left by the explosion. The plant was expected to go online this summer, Giuliano said. Santostefano initially said about 50 people, most of them construction workers, were working at the time, but Giuliano said "we don't know that as a hard number right now." "What I've been told by the owners of the project is that there could be anywhere from 100 to 200 people working on the site on any given day," Giuliano said. But Santostefano later said the numbers Giuliano cited were weekday figures, and he repeated his estimate of 50 to 60 people at the site Sunday when the explosion occurred. He said he thought most of those escaped the blast. A no-fly zone was established over the site because of the unstable structure, Gov. Jodi Rell announced Sunday night. Middlesex Hospital in Middletown said it received 11 patients from the explosion. One patient with serious injuries was flown to a hospital in Hartford, and another was transferred to Yale New Haven Hospital, according to a statement on Middlesex's Web site. Two others had minor injuries and were treated and released. The remaining seven patients sustained injuries "mainly to the extremities, including broken bones, blunt trauma and abdominal pains," the statement said. Emergency room physician Dr. Jonathan Bankoff told reporters that some patients reported being thrown 30 or 40 feet by the blast. Two people were airlifted directly to the Hartford hospital from the scene, Middlesex spokesman R. Brian Albert said. A center was being set up at Middletown's City Hall for relatives of plant workers, he said. As of late Sunday afternoon, the hospital said it was not expecting more patients from the plant. After the explosion, it took a while for emergency crews to get into the plant, Santostefano said, because the plant was on fire and the natural gas had to be turned off at the source. No major incidents at the site had been reported since construction began there a couple of years ago, he said. People miles away reported hearing or feeling the blast. "It felt like the house was shaking," Peter Moore, who lives about 10 miles away in Durham, told CNN. He said he thought at first there had been a traffic accident on his street or there was a problem with his house. Moore said his mother, who lives in Woodbridge, about 20 miles away from the plant, also said she heard the explosion, and said it "sounded like someone pounded on the back door a couple of times." "It was almost like an earthquake," nearby resident Lynn Townsend told CNN affiliate WTNH. She said she heard the explosion and went outside to see "a very big, bright orange flame" between the plant's two smokestacks, and immediately dialed 911. "It really shook the house," she said. "Everybody was scared. The kids started to cry." Connecticut State Police Lt. J. Paul Vance told WTNH his agency has received "an immense amount of inquiries" from residents who heard or felt the explosion. 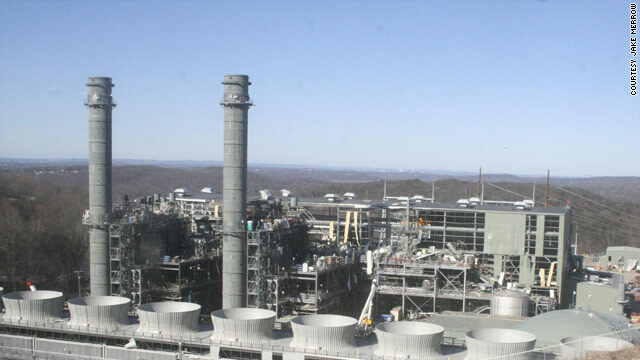 The site is a 620-megawatt gas-fired power plant, according to plant manager Gordon Holk.